Cars are destroying the world¡¦s forests. A quarter of the forests lost in the last 10,000 years have been destroyed in the last 30 years. To help turn the tide, Greenpeace is launching a campaign for the Car Free Day 2009. Client wants to persuade car drivers to leave their cars at home and stop driving for one day. Budget is limited. 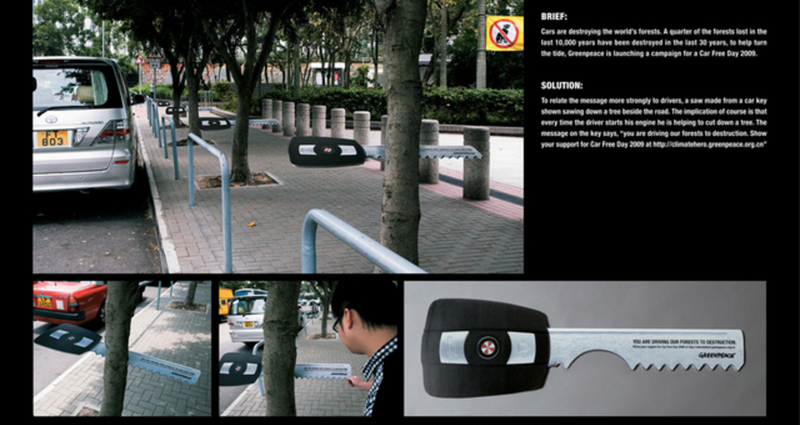 To drive the point home to drivers and make them understand the direct link between their behaviour and the destruction of trees, a saw was created out of car key and is shown in the ad being used to cut down a tree. The implication of course is that every time the driver starts his engine he is helping to cut down a tree. The message on the key says, ¡§You are driving our forest to destruction.¡§ Having made the point, the ad then offers a solution by inviting drivers ¡§Show your support for Car Free Day 2009¡¨ at climatehero.greenpeace.org.cn¡¨. Jones Client: Chicago Cubs Title: "Winters"